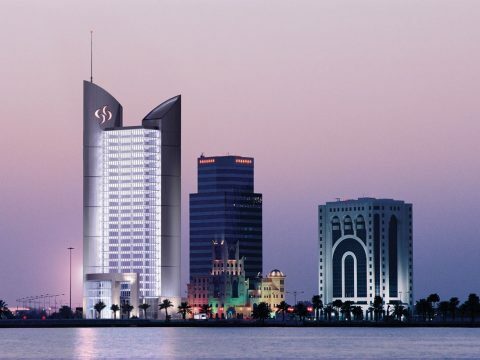 LOM led a full consultant team to deliver the design vision for Commercial Bank's regional headquarters in Doha. The headquarters tower consists of 26 storeys providing office space and support facilities including a prestige bank branch, rooftop restaurant, executive suites, basement parking levels and leisure facilities. Working with Buro Happold, Davis Langdon and Roger Preston and Partners, we were able to deliver a stunning building concept offering the first clear fully glazed facade in the region, a feat of design drawing on the latest developments in facade engineering. The tower has a twin core design, with each core expressed as an elegant steel support to the lightweight glass building. The cores incorporate high speed lifts, and services, leaving the office floorplates between as clear, unobstructed space offering stunning views across the Doha Corniche.